Thanks to Minty Lewis for the illustrations and Katherine K. Robinson for help with the design, to Allie & Becky for recipe testing and Kevin for a very thorough editorial eye. Information on where the find the booklet and how to pre-order will be up soon. Thanks to all of my amazing customers and supporters! After 2 years of pies, I’ve decided to move on. 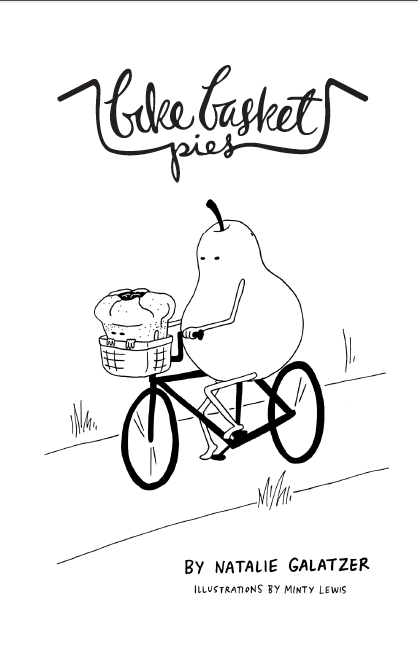 Feel free to drop me a line at natalie@bikebasketpies.com – let’s chat about collaborations, projects, or just grab a drink. I’m currently working on writing a recipe book to memorialize the past two years – it will be published and available within the next few months! More information will be posted here, as it becomes available, and of course I’ll announce it’s completion on twitter and facebook. The short: the hours are rough, I have very little free time, and I have a bit of trouble paying rent despite working seven days a week. The long: Bike Basket Pies started as something really small – another job when I already had two, but something fun, something inspiring, and something to call my own. I never expected it to much more than a creative summer project and a few extra bucks, but it quickly grew and kept getting just slightly bigger and bigger. It turned into a legitimate business and I always treated it with an intense work ethic, and initially it was a helluva lot of fun. But at it’s current state, it consumes my time and life, and I don’t get to exercise the same creativity I did at its inception. I’m excited to find a new project to jump into. Sign up for weekly pie email updates!